Tan Hwei Ee is the author of The Hwei Construct: A Little Collection in His Teens. He was born in 1991 in Singapore. He studied at Nanyang Primary School, then River Valley High School in 2004 and thereafter at Hwa Chong Institution (High School) from 2005 to 2007. 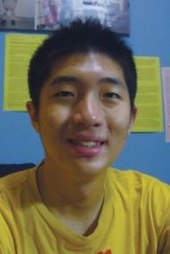 He is currently 18 years of age and in his second and final year at Hwa Chong Institution (College). A brilliant and well-rounded student, Hwei Ee was selected to be in the Innovation Programme at River Valley High School, and was in the Science and Math Research Programme at Hwa Chong. He was also in the Nanyang Research Programme 2007 organised by Nanyang Technological University; and Science Research Programme 2008 by National University of Singapore, culminating in various prestigious science symposiums and fairs. In addition to his flair for the sciences, his aptitude for humanities subjects was demonstrated by his decision to take up the humanities research modules throughout his secondary school years at Hwa Chong. Hwei Ee is also an avid writer. This book – his very first – is the literal manifestation of his sustained passion in writing and literature. This book showcases his wide repertoire of both fictional and non-fictional works in this representative collection of his writings. Hwei Ee has three defined aspirations. His first is to be a writer. His second is for a career in life sciences research. His third is to be a university lecturer.